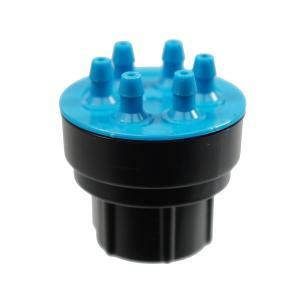 This 6 outlet drip manifold allows watering to six different locations from a single source. This is a manifold, not a regulated flow drip emitter. Outlet flow can be varied by using a drip emitter (of your choice) at the end of the 1/4" (.170" ID x .250" OD) distribution tubing. The 1/2" FPT inlet is compatible with 1/2" poly risers or any other 1/2" male pipe thread connection. Manufactured from UV-inhibited engineering grade plastics. Recommended filtration of 100 - 150 mesh. Each multi-outlet dripper includes outlet caps for closing off unused outlets.